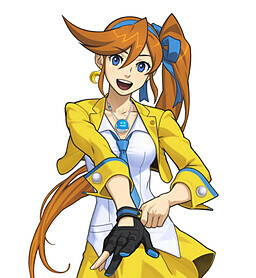 Athena Cykes is one of three defense attorneys in the Wright Anything Agency, working in this capacity alongside Phoenix Wright and Apollo Justice. She is a specialist in analytical psychology, which she studied in Europe. Cykes has a special ability to pick up subtle emotions from witnesses' voices, and she examines these using a program called the "Mood Matrix". The Mood Matrix is linked to her AI partner Widget, who hangs around her neck, that changes color with her emotions.